Yankee Barn Homes invites you to “Artists for Barns” Art Exhibit at the Gathering House Model Home. Yankee Barn Homes and Gallery on the Green, the Woodstock, VT based art gallery, cordially invite you to the Yankee Barn Homes “Gathering House” model home for an Artist for Barns art exhibit and local wine and cheese tasting. 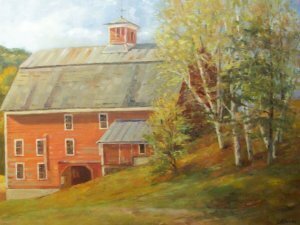 View and buy paintings or prints by 16 New England artists to help restore the “giant barn” at the historic Robinson Farm in Woodstock, Vermont. While browsing the art, enjoy complimentary wine and a variety of local cheeses. This barn in Vermont will benefit from the funds raised by the artists participating in the show. Painting by Patricia Sweet-MacDonald. Saturday, November 20, 2010 from 2:00 pm – 6:00 pm. Sunday, November 21, 2010 from 2:00 – 6:00 pm. Saturday, November 20 from 2:00 – 5:00 pm. 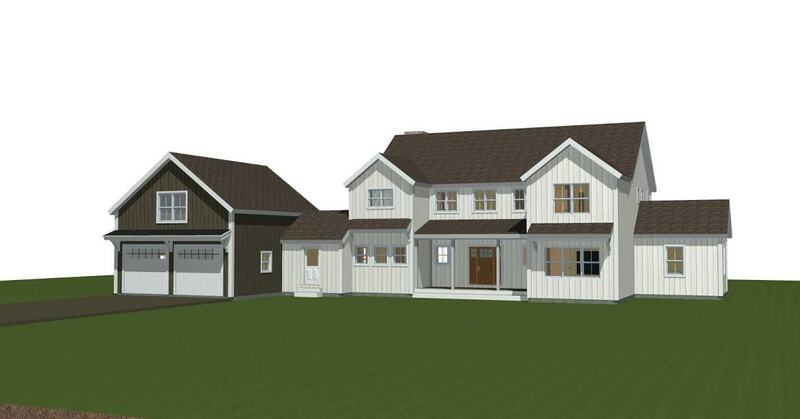 The Yankee Barn Home “Gathering House” Model Home. Need directions? Visit Yankee Barn Home’s website. 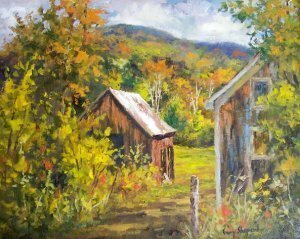 Help save our New England barns by purchasing originals and glycee prints of artworks created specifically to benefit our New England barn heritage. On average, a barn collapses in Vermont due to age every 4 days. 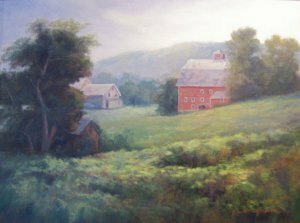 Gallery on the Green asked 16 New England artists to participate in “Artist for Barns” by producing works of art influenced by the Robinson Farm in Woodstock, Vermont. Proceeds from the sales of these works will help to fund improvements to the Robinson Family Farm’s “Giant Barn”, which is in heavy danger of collapsing. Behind The Barn, by Gary Shepard, will be available for purchase. Barn Homes Are To Die For! next post: Today’s Barn Home: Post. Beam. Dream.